Russell Farhang in Speakeasy Dollhouse: The Brothers Booth. Photo by Jeremy Daniel. BOTTOM LINE: Journey to a glamorous party in 1919 in this interactive theatrical event. Immediately I’m thrown into the shadier secrets of this seemingly glorious party. My guest and I purchase some “special coffee” and we start to mingle among the party goers. In one corner of the room a couple named Mr. and Mrs. Hope (Paul Duncan and Kate Black) invite us to sit for a photograph. They claim to be spirit photographers. We sit down and pose for them for a minute or two. We are then asked to pick up our photograph at the end of the evening after Mrs. Hope develops them in a dark room upstairs. And there, the party begins. This is the immersive theatrical work The Speakeasy Dollhouse: The Brothers Booth, directed by Wes Grantom and created by Cynthia von Buhler. 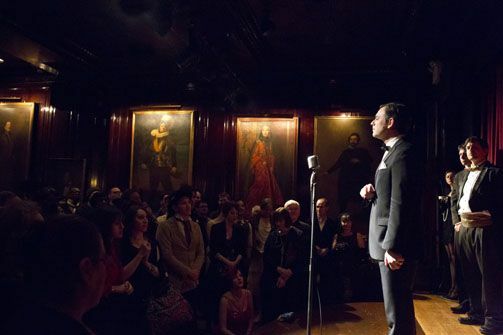 It takes place inside the historical Players Club at Gramercy Park South. This is the second project of this genre by Ms. Von Buhler, after her popular The Bloody Beginning, based the true event on the murder of her immigrant speakeasy owner grandfather. A glamorously makeup-ed woman straight out of the 1920s greets us on stage. Her name is Tansy, our hostess of the evening. With the presence of John Drew (Russell Farhang), the president of The Players Club, Edwina Booth Grossman (Samantha Rosentrater), Edwin Booth’s daughter, and Howard Kyle (Allen Wilcox), they announce the unveiling of a statue of Edwin Booth in Gramercy Park. In the middle of a toast by Edwina Booth Grossman, a tattooed, underdressed tall man (Dan Olson) enters and shouts accusations of conspiracies, mummies, curses, and the taboo subject in this evening's celebration -- John Wilkes Booth, Edwin Booth’s infamous brother. Thus begins our adventure inside the mansion and into the minds of the troubled brothers. Upstairs there is a narrated puppetry show titled “Obligate Siblicide on the Galapagos Islands”. A game of cards and some gambling is going on inside the V.I.P. room (access granted for the higher priced ticket holders only.) A gentleman with silvery hair and moustache bearing striking resemblance to Mark Twain is seen at the cards table. In another corner of the room conversations are overheard surrounding the rumors on the Booth brothers’ rivalries. Gypsies and séances fill another part of the mansion. Apparitions of Edwin Booth (Eric Gravez) and John Wilkes Booth (Ryan Wesen) occasionally haunt the party, revealing glimpses of their relationship in turmoil. This piece is a spectacular experience, but some of the attending guests would not keep quiet during key moments of drama. Perhaps they felt too much a part of it, having been encouraged to come in the latest 1919 "flapper and dapper fashions" themselves. Despite the charming performances by the entire cast on and off stage, there are some long periods of time without dramatic action which may have contributed to the inattentiveness of some. I recommend this show to audience members who can appreciate an interactive theatrical experience, allowing the subtle glamour of this historic location to reveal itself with a dramatic mystery as the backdrop. Try to read up on the background stories before you come, it will tremendously enhance your experience.